Cole Slaw Recipe is an old fashioned southern recipe made with cabbage, homemade mayonnaise and vinegar dressing. Included are instructions on How To Make A Cabbage Bowl that will add fun to your parties or everyday meals. The original salad was made to serve with fresh caught fish. It is delicious with many other vegetables and meats such as Chili Hot Dogs, BBQ Chicken or pulled pork. Homemade Coleslaw is a must with seafood dishes in the South. *This type salad dressing is the kind that is in a jar and looks like mayonnaise. It is a cooked dressing and is sweeter than mayonnaise. If you don't like a slightly sweeten salad, omit the dressing and substitute an additional 1/4 cup mayonnaise. If serving this salad with baked beans, substitute 2 tablespoons of homemade BBQ Sauce for 2 tablespoons of the above mayonnaise for an excellent meal. Serve on top of homemade Chili in a hot dog bun for an old fashioned State Fair, hot dog taste. You may substitute white or green cabbage in the recipe. Wash Cabbage and pat dry. Set it on a flat surface to see if it sits balanced. If not, trim the bottom with a paring knife to make it level. Cut the top opening diameter large enough to insert a small glass bowl into the cavity to hold your slaw. This prevents your dressing from leaking. 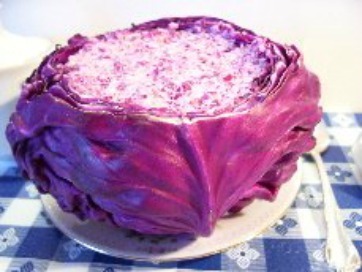 Next, using a vegetable or fruit corer take out the inside of your cabbage, leaving an outer shell (your cabbage bowl). When enough cabbage is removed to accommodate your insert, place it into the cavity and set aside. Mix your slaw ingredients together and fill your bowl. Using the back of a spoon, spread slaw, hiding the outer edges of insert. Refrigerate salad a few hours for best flavor. Serve on a platter. Lovely for your cook-out or party!